Recent attention on the early development of circadian rhythms has yielded several avenues of potential study regarding molecular and physiological rhythms in embryonic stem cells (ESCs) and their derivatives. While general guidelines of experimental design are—as always—applicable, there are certain idiosyncrasies with respect to experiments involving circadian rhythms that will be addressed. ESCs provide a number of challenges to the circadian biologist: growth rates are normally much higher than in established cell culture systems, the cells’ innate drive towards differentiation and the lack of known synchronizing input pathways are a few examples. Some of these challenges can be addressed post hoc, such as normalization to total RNA or protein for transcript abundance studies. Most others, as outlined here, require special handling of the samples before and during experimentation in order to preserve any potential circadian oscillation that is present. Failure to do so may result in a disruption of endogenous oscillation(s) or, potentially worse, generation of an artificial oscillation that has no biological basis. 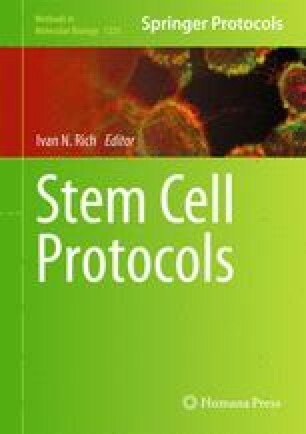 This chapter begins with cultured ESCs, derived from primary blastocysts or in the form of cell lines, and outlines two methods of measuring circadian rhythms: the 2DG method of measuring glucose uptake (Sokoloff et al. J Neurochem 28:897–916, 1977) and real-time measurement of molecular rhythms using transgenic bioluminescence (Yoo et al. Proc Natl Acad Sci U S A 101:5339–5346, 2004).